Strangely enough, the history of Pachinko starts in a most unlikely place and time. Table-based games first appeared in the early 15th century in England, an apparent attempt to bring popular outdoor games such as croquet indoors. The first such games featured wickets, which were eventually replaced by wooden pins to be knocked down. In the 17th century the games evolved to include pockets. These games became what we know today as billiards. In France in the early 18th century someone took a billiards table and narrowed it, placing all of the pins on one end with targets behind them. The pins took too long to reset after each shot, so they were replaced by static pegs, while the targets were replaced by holes. The object of the game was to shoot ivory balls up an inclined plane peppered with posts and into a series of scoring holes. In 1819 the game was standardized and called "Bagatelle", a french word meaning "a trifle". Bagatelle quickly spread to America, where is became so popular even President Lincoln played the game. Corinthin Bagatelle or the "Korinto Gemu" was first imported into Japan in 1924, and it was not long before candy store owners began putting them on the counters of their shops. Different holes had different values, and children were given small pieces of candy or fruits if they achieved a high enough score. By the late 1920's, nearly every candy store had the machines, and the children took to calling them "Pachi-Pachi", which means the clicking of small objects or the crackling sounds made by a fire, an obvious reference to the sounds made while playing the game. So-called "Roten" stalls, holding 3-5 bagtelle-type machines began appearing in markets around 1924. Adults would play Korinto Gemu, and wager for a chance to win small prizes such as cigarettes, soap, or detergent. As early as 1910, a British wall game called "The Circle of Pleasure" was invented and distributed. This innovative machine had many of the common features of what would become known as pachinko, including races, scoring pockets, and even a slingshot-style flipper. It was a popular pub gambling device taking in and paying out coins. In particular, it was set up in a vertical configuration with glass restricting the balls to the playfield. The Circle of Pleasure used a single glass marble that never left the machine. Space has always been at a premium in Japan, and so in 1926 some Korinto Gemu characteristics were morphed with the space-saving Circle of Pleasure machines. The brass nails from the bagatelle joined with the basic design of the Circle of Pleasure to create the first true pachinko machines. This allowed most Roten booths to hold upwards of 10-15 machines in the same space. However, it was not until 1929 that the vertical machines gained universal acceptance. This vertical machine was called "Pachinko", a reference to the sound of the game being played. In 1930 the Aichi prefecture headquarters granted the first ever licence for the operation of a "Gachinko" hall, and it was in Nagoya. Gachinko was a play on words from a sumo wrestling term for a frenzied or fevered shooting forward move. Today the word means "Gonzo" or "fevered", a precurser of the so-called "fever mode" on modern electronic machines. The term is a throwback to the gachinko or "Fever" parlors of the 1930's. 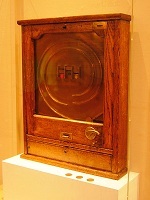 Initially, these early pachinko machines were designed to dispense a small metal token or medal when a ball landed in a scoring pocket as a way of keeping score. In 1936, The game of pachinko became an overnight sensation. In Kochi alone, 35 parlors opened in just six months. Late in 1936 pachinko machines appeared that had standardized 11mm 5g balls, and the balls themselves were used to keep score. Unfortunately, there were few produced and they did not have the opportunity to become popular. In 1937 the production of pachinko machines was halted because both the materials and the manpower were needed for the war in China. In 1938 all of the existing parlors were ordered closed. After WWII, machines were once again produced and the pachinko parlors spread once more, beginning in 1946 in Nagoya. By 1947 prize balls replaced the medals in nearly all machines. In 1948 Shoichi Masamura introduced the masamura gage, or the "Positive Gage Forest". Prior to this innovation, balls followed mostly vertical paths through rows of nails. The Masamura gage allowed balls to bounce around, and if they missed one pocket, they might still score in a lower one. By 1952 nearly all machines had adopted the Masamura gage. In 1949 Masamura developed the first game in which more than a single ball could be won. This was the famous "ALL-10" machine, with each pocket paying out 10 balls. In 1950 he upped the ante with the the first "ALL-15" machine, a machine with 8 scoring holes each of which payed out 15 balls. Other manufacturers quickly followed suit, and the ALL-15 became the standard for the next three decades. 1949 also saw the establishment of Bussan Marushin and Heiwa companies, making many thousands of machines in just the first year. In 1951 several manufacturers began producing "All-20" machines called "Barrage" machines, but these were outlawed in 1953 by the gaming authorities. Additionally, 1951 marked the beginning of the Sophia Nishijin company which would produce millions of popular pachinko machines for decades. in 1952 the Kyoraku company began producing their first machines in Nagoya. In late 1952 the first autoloaders or the "Renpatsu-shiki" (successive shot) pachinko machines were developed, enabling players to shoot 160 to 180 balls per minute. In the summer of 1953 the gaming authority made it illegal to produce Renpatsu-shiki that paid more than one ball per win pocket, marking 1952/1953 as the only years of that era in which autoloading ALL-15 machines were produced. By the end of 1953 there were 387,664 registered parlors, and over 600 manufacturing companies. In 1955, Sanyo Bussan was established in Nagoya, and they continue to make pachinko machines today. In 1957, the Takeya "Expression Drone" model was produced. This model was specifically produced to be placed in the long familiar rows parlors now use, with attendents taking care of the machines from a pathway between the rows. The Expression Drone was also the first machine designed to be backlit by the lighting in the passage between the rows. Other manufacturers quickly added colored gels behind playfield features to take advantage of this new configuartion. In 1958 the famous Fuji Shoji company began business producing machines. In 1960 both the first tulip and the first direct use electrical power (10VDC)for lights made their appearances, although neither was ubiquitus until 1962. The tulips are considered to be responsible for a resurgance in the flagging pachinko industry that had been suffering from low attendance and profits since the restrictions imposed in 1953. Toyotec was established in 1960 as well. 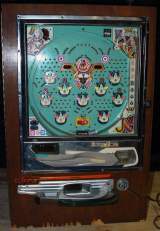 1961 also saw the release of one of the most popular pachinko machines of the era, the Marudai New Prince. This pachinko machine was created to commemorate the birth of the Crown Prince Naruhito in 1960, and was produced for several years afterward due to high demand from parlors and players alike. In 1965 the first "olympia" machines were produced, reel machines that are the direct precursers of the popular Pachislo machines. 1966 saw the establishment of The Sankyo Company and their first machines sold extremely well. In 1969, restrictions on Renpatsu-shiki machines were lifted, leading manufacturers to retrofit earlier ALL-15 models with autoloading features. In 1970 the first true modern Renpatsu-shiki were released. Early models were refered to as "front overflow machines" that dumped balls into the bottom tray through an external spout. In 1972, the gaming authorities authorized the use of motorized handles, or "shooting knobs". The knobs were produced rarely on models from 1973 through 1976 as they met with a great deal of resistance from traditional players. Although acceptance was slow, by 1980 nearly all machines incorporated knobs and the models with flippers were all but eliminated from production. 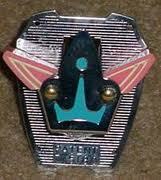 In 1974 Nishijin released the first electro-mechanical pachinkos branded as the "Powerflash". It utilized a series of solenoids to open and close the tulips according to preset conditions. This was quickly followed up in 1975 by the Nishijin "Circuit Racer", the "Fish", and the " Power Roulette" models. These machines were the immediate precursers to the the Arepachi pachinko machines, sometimes called "arrangeball". Arepachi combines elements of bingo with pachinko and is an interesting hybrid of the two. In 1975 several importers began flooding the retail stores in America with used pachinko machines from Japan. Mildly "refurbished", these machines were sold through chain outlets such as Sears, Kmart, Pier 1 imports, and Woolworth. The vast majority were Nishijin recycler style machines from 1971-1972 (Model 1200) and Shiroi-Kamome versions from 1973-1975(Model 3200). The true number imported and sold in America is unknown, but it is certainly in the millions. Many pachinko machines still bear the stickers from importers such as Pachinko Palace and The Pachinko Factory, Target Abroad, and Meshulam's. The majority of these machines came in through the ports of California and Washington and were distributed to other major hubs such as Chicago and Philadelphia. With the proliferation of video games beginning with space invaders in 1978, in 1980 pachinko manufacturers ended the fabrication of mechanical pachinko machines and began producing electronic versions with video and sound features. The first pachinko machines of this era had LED lights, but this quickly evolved into LCD video screens. Some models even incorporated small televisions in the center so that players could watch TV while they enjoyed their game. Advanced computerised pachinko machines still fill the japanese parlors to this day, and a thriving business still exists for the import of pachinkos from Japan. Millions still play this game every day in thousands of parlors.